Premier Chimney Sweeping Services is a small Newcastle based business, offering a premium service with both traditional rod and brush, and power sweeping, alongside safety inspections and stove/appliance cleaning. The company owner wanted a simple online “shop window” which explained clearly and effectively the how, what and why of the modern chimney sweep, from smoke tests and carbon monoxide poisoning, to birds nest removal. 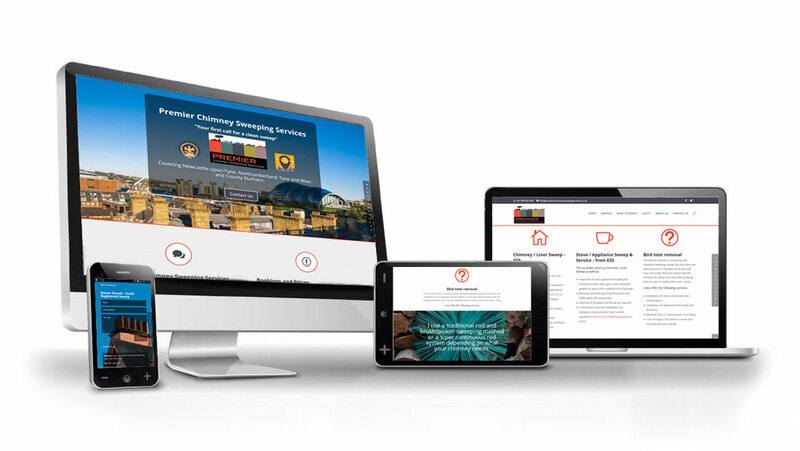 A simple one page responsive website, easy to navigate, with a clear call to action, which has brought new business to the company by explaining exactly what they offer. The site was largely illustrated by photos that BW3 took around Newcastle. It is regularly updated with the likes of trade body membership and relevant links, and we also did a lot of work with the client on SEO to ensure that they now appear as one of the top search results for their desired key words and phrases. I’m really happy to recommend Paul and BW3. He produced a website that perfectly suited my needs with the minimum of fuss and at an excellent price, and it looks really good as well! I have absolutely no technical or design background but Paul is very easy to talk to and he quickly appreciated what I wanted from my site, which made the whole design process a very smooth one.